In our house, we love pizza. Wholly. Equally. Unequivocally. Unapologetically. Completely. Totally. But, if I had to pick favorites, I love the non-traditional pizzas. No pepperoni or ‘just cheese please’ here. Not that I have a diatribe against a pepperoni pizza… it’s still the first one I go for at the Superbowl parties. But, I get excited about toppings like olives, chicken, BBQ, Tex Mex ingredients, so on and so forth. I have shared with you one of my other favorite pizza recipes, Fig & Proscuitto Pizza, and now this one is a new favorite too! I have long loved the combination of leeks and potatoes. It’s a delicious soup, so ‘why not a pizza?’, I asked myself. 1. For the garlic oil, combine the olive oil and the crushed garlic clove in a small sauce pan and bring to a simmer. Allow to simmer away for a few minutes until the garlic is lightly-brown in color and the garlic has imparted it’s amazing garlicy flavor. Yummy! Set the pan aside and allow oil to cool. 2. In seperate saute pan, along with a little of that delicious garlic oil (about a teaspoon or so), place leeks in skillet on medium heat and saute until tender. Set aside. *Note on cleaning leeks: Leeks are a sandy veggie. Sure-fire way to destroy a yummy slice of pizza? Sandy leeks! So, here is my tips on leek-cleaning. Trim down the darker green parts, these are tough and inedible, and cut off the root end as well. Or, you could go ahead and finely chop your leeks, place them in a bowl with cool water, and slosh around ensuring they are nice and clean. 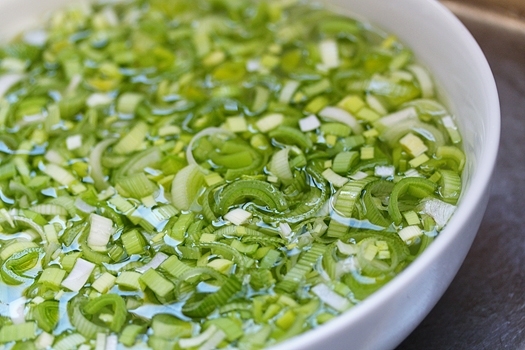 Whatever your method, just be sure that the leek is nice and dry before you saute! 3. Roll out the pizza dough to desired thin or thickness, brush liberally with the garlic oil (this is the sauce), and layer on the thin slices of potatoes slight overlapping (the key here is to make a solid layer), give the potato layer a little salt for flavor, then plop on the mozzerella cheese shards until the potatoes are blanketted in a nice cheesy layer, then sprinkle on those gorgeous, onion-y sauteed leeks, pile on those salty bacon bits, and then generously crumble herbed goat cheese on there too! Love this addition, so savory and tangy! As a final touch, crack some fresh black pepper over the top and bake at 400 degrees for 15-20 minutes or until pizza is crispy and the toppings are tender and melty. It’s creamy, salty, garlicy, oniony, peppery, and all together delicious. It’s a can’t miss slice of pizza pie!